As I have suggested earlier, with the exception of the recently published articles by Weaver and Braune, the only author to give more attention than a few sentences to the Cunningham mesostics is Cage’s fellow poet Jackson Mac Low, who writes of this sequence, albeit still quite briefly, in “Something about the Writings of John Cage,” and its later, heavily revised version, “Cage’s Writings up to the Late 1980s.”[i] Mac Low describes the poems as Cage’s first foray into “writing asyntactical mesostics, employing I Ching chance operations, and ‘writing-through’ methods” (“Something” 289). In its first incarnation, Mac Low’s essay moves from this statement to a lengthy quotation from the foreword to M, culminating, as references to the mesostics are wont to do, in Cage’s statement that the poems looked like “waterfalls or ideograms,” which is followed by a note about their eventual performance (289-90). In its later revision, however, the essay moves from this sequence to other, often earlier, poems by Cage which are also “asyntactical,” most notably “Mureau,” which is also collected in M. Mac Low then returns to the Cunningham mesostics to use the same lengthy quotation as the earlier version, ending again with the reference to “waterfalls” and “ideograms” (“Cage’s Writing” 215-220). This minimal discussion of the Cunningham mesostics in Cage scholarship is especially significant because what little scholarship exists tends to be preoccupied with Cage’s own explanation of the sequence. This shift from analysis of the text to analysis of an author’s explanation marks an important facet of the scholarship on Cage, specifically that as the poems become indeterminate, largely illegible, and interested almost completely in form, the scholarship moves away from the poems themselves, and towards the poetics. One justification for this shift might be that by studying Cage’s poetics rather than studying the poems themselves as end results, the focus of the scholarship shifts from product to process, and this, would be a shift in line with Cage’s poetics more generally. This emphasis on production is important, to be sure, but as it moves away from the texts at hand, and focuses instead on the work of the author’s production of the text, these critical examples tend to reify the writer and his process, a move than runs counter to Cage’s work more general, and is most certainly counterproductive to a postanarchist reading practice. In my final plateau on Cage, I would like to propose a postanarchist methodology for reading these mesostics that looks to authorship in the poems as an integral part of the text, and one that invites readers to take part in that very process as they read. As I have previously indicated, a discussion of authorship in the Cunningham mesostics is extremely difficult, and must be at the very least tentative, because, of course, in the conventional sense, Cage has not written these poems. In terms of content, the “syllables and words” found in the poem were, as Cage writes in the foreword, “obtained from Merce Cunningham’s Changes: Notes on Choreography and from thirty-two other books most used by Cunningham in relation to his work” (ii). And, the order in which the words appear was decided, not by poetic diction, but by chance. The source texts were subjected to I Ching chance operations, “a process which brought about in some cases syllable exchange between two or more of them” (“Foreword” ii). The form of the poems, too, is, to some degree, outside of Cage’s control. While Cage decided on the mesostic form, and on Cunningham’s name as the poems’ “spine,” the poems are composed in “over seven hundred different type faces and sizes available in Letraset and, of course, subjected … to I Ching chance operations” (“Foreword” ii). In this deference to chance and indeterminacy, the image of the author, even in abstract or experimental art, gets critically complicated. There is little correlation between Cage subjecting Cunningham’s books, and later Letraset typefaces, to chance operations and the more traditional notions of poetic production (sprezzatura, Romantic inspiration, &c). However, it would be inaccurate to claim that Cage’s use of the I Ching, or of chance more generally, was designed to eradicate the role of the author. While chance is certainly one of the most often studied aspects of Cage’s work, it is also, as Constance Lewallen writes in “Cage and the Structure of Chance,” the most often misunderstood: “misunderstood because it is often mistakenly believed that Cage used chance to avoid making choices” (235). Of course, Cage made many choices in the production of the Cunningham mesostics, not only selecting the source texts, but selecting them based on the intimately personal criteria of those “books most used by Cunningham.” In this way, Cage’s use of chance is not a way to avoid making decisions about the poems he is writing, but rather a way to change the kind of choices the author makes. In this sense, he “use[s] chance as a discipline … to circumvent personal taste and memory so that he would be more open to outside experiences” (Lewallen 236). Cage identifies this misunderstanding himself in an interview when he says, “Most people who believe that I’m interested in chance don’t realize that I use chance as a discipline. They think I use it – I don’t know – as a way of giving up making choices. But my choices consist in choosing what questions to ask” (Kostelanetz 17). In this way, Cage’s role as author of these poems becomes destabilized. 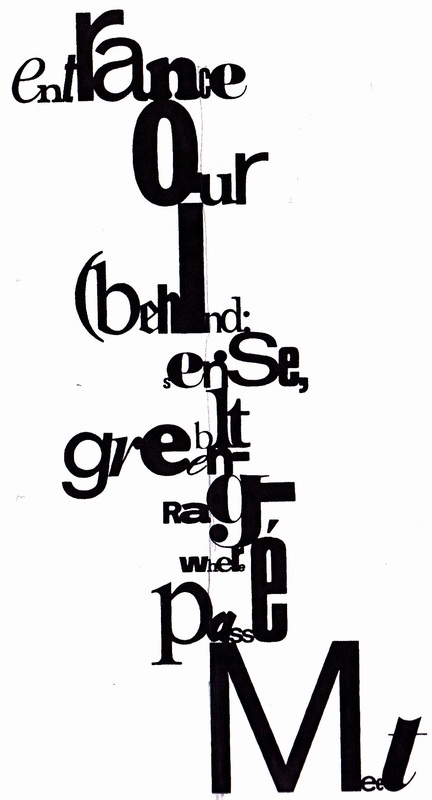 Instead, the poems are written by a sort of collective involving Cage, who asks the questions, and Cunningham, whose work dictated the source texts Cage would choose from, and which books he ultimately chose, but also including the I Ching and the Letraset typefaces, all working in tandem. Importantly, a postanarchist reading of the poems includes the reader in this collaborative view of the poems’ production. As the reader enters in the comunis of communication with the texts, and takes value from the intensities of the noise produced in the ansyntactical poems, s/he engages in this production in a manner that Cage as author can neither control nor predict. For example, the “h” “i” and “n” in the word “(behind” in one poem blend so that there is no space on either side of the “i” (150). Further down this poem, a “g” is so attached to a hyphen and a comma, the three appear to make one unique character together. In the poem just following this, an enormous “o” takes up two full lines, and it would be unclear which line the “o” was meant to start were it not for the fact that both lines consist of actual English words: “people” and “other” (151). In this way, form and content work to support a collaborative authorship that destabilizes the traditional understanding of the expressive self as artist. Perhaps the most important element of the writing of the Cunningham mesostics, one that necessarily influences the poems themselves, is that of ease and practicality. These issues of practicality are not often discussed in terms of Cage’s work, despite their importance. The romantic, anarchic, and experimental reasons why Cage would, for example, structure his poems in this way, are certainly more seductive, but the practical elements that inform these decisions are worth noting, especially because they provide additional readings to a work that already provokes multifarious readings. I am speaking here specifical of the critical issue of the length of Cunningham’s name. Cage gestures towards this issue himself in the foreword to M. According to his account, he initially “tried to write syntactically as [he] had in the case of the Mesostics Re and Not Re Marcel Duchamp, but the length of Cunningham’s name proved an obstacle” (i). Instead, he writes the poems using chance operations, and avoids syntax altogether. Moreover, the decision to have the letters touch, which I have read as a poetic decision throughout my work, was also made out of practicality, wherein Cage could turn the length of Cunningham’s name “from obstacle to utility” (“Foreword” i). Discussing the practicality in this way, and especially in using the term “utility,” Cage brings the focus away from purely poetic readings, and forces the reader to engage in the production of the poems on a very real, material level. It is perhaps not very interesting, even potentially mundane, to note such practicalities, but the issue of the length of Cunningham’s name is of great importance to any study of the work, and more generally, the issue of practicality is very important for Cage’s poetics. In fact, when asked in an interview what his “greatest legacy to future generations” would be, Cage replied in his characteristically axiomatic way: “Having shown the practicality of making works of art nonintentionally” (Kostelanetz 26). In view of the painstaking, laborious process of subjecting so many books to I Ching operations, and then subjecting each letter in the poem to these operations to decide the typeface, the idea that this manner of “making works of art” is practical seems improbable. But, the practicality here is not in the production of the poems so much as in the poems that are produced, and how these poems could come to be read. In this way, Cage has succeeded in the creation of a poem that is practical, easy to read, and infinite in the reading processes it evokes. Without the power over both reader and writer innate in expression (however abstract), the militarized language of syntax, or even the limitations of pre-existing words, Cage creates a poem that is infinitesimal in the ways it can be read and, perhaps even more importantly, by whom. The goal of creating literature that can be read by anyone seems to have been a preoccupation of his. As Cage says in an interview in 1971, the same year the Cunningham mesostics were first published: “I am hoping to find a language in which people can read in their own way, no matter where they come from” (Kostelanetz 143). [i] Most texts make only brief reference to the sequence: Peter Dickinson’s volume, Cagetalk, mentions the Cunningham sequence only once, and this in passing, as part of a list of concerts involving half of Cage’s work, and half of the composer David Tudor (186). Richard Kostelanetz’s collection of interview excerpts makes only one reference to these mesostics, and then only as a performance piece (Kostelanetz 171). Where more than a passing reference is made, discussions of these poems tend to remain very much limited to Cage’s own discussion in the foreword to M. For example, James Pritchett’s The Music of John Cage, notes that this sequence acts as a “precursor to [his writing-through] method, with its words drawn at random from Cunningham’s writings and other books” (178). Pritchett revisits the sequence a few pages later, only to refer to what Cage notes about the chance-operations he used to decide the sequence’s idiosyncratic typefaces, and to quote Cage’s argument that the poems look like “waterfalls” or “ideograms” (Pritchett 182-3). Even David Revill’s celebrated biography of Cage, The Roaring Silence, fails to discuss these mesostics in any more depth than Cage’s foreword (234-235), and completely shies away from making any connections between the mesostics and Cage’s relationship to Cunningham, in an almost New Critical aversion to reading the author’s life into his work. 1) I chose to avoid close reading of the mesostics in order to avoid limiting the possible readings; do you see that as a reasonable stance? You seem to state that close reading can maintain, or even proliferate the polysemy–could you expand on that point? 3) I don’t quite understand the “postanarchist reading” aspect of this post–could you make that element more clear, or more central? Ooops, looks like I forgot to respond to this comment in the rush of comments last week. 1) This is something that I’ve actually long been concerned with in my own work, and something about your work on the Cunningham mesostics that has fascinated me. What I’ve come to think about it is that close reading (reading, interpreting, meaning-making) is going to happen when a reader encounters a text. I think that close reading of asyntactical texts can indeed proliferate the polysemy of these works insofar as the reader accepts no reading as correct, or exhaustive, or even accurate. From the perspective of a postanarchist literary theory, the very act of reading a text involves the reader in the process of meaning-making as active rather than passive. By close reading as I have, or reading theoretically/analytically as you have, we both contribute to various potential readings of the text, and, in essence, open up the potentials for other new readings beyond us. 2) I love the idea of these poems as erasure/trace. And, I agree that Lewallen’s point about circumventing personal taste is directly related to Cage’s aversion to “love” proper. In this sense, the poems attempt to articulate an element of love that is necessarily extralinguistic (or, as I suggested earlier, extrasemantic). I think we may have to start distinguishing between a Love and a love (like the Power/power division). They are, certainly in light of Cage’s work, two separate things. 3) I hope that my first comment has addressed that. But, this comment brings up an important issue with the blog form that I am going to have to work to remedy in my later posts. That is, when I use terms that have been expanded upon in earlier posts, or when I rely on notions that I’ve outlined earlier (but do not clearly integrate), I lose part of the appeal of the plateau form. At this point in the project, I have to ensure both that the various posts cohere, and that the function on the individual level. Good points! I particularly like the idea of distinguishing between Love/love, which seems to work around Cage’s somewhat thorny comment about love as blindness. Talking about choices: Cage made a choice to use the I-Ching as his most prominent mode of procedural constraint. In terms of a postanarchist literary criticism, how would the I-Ching fit in? What are the political implications of using the I-Ching? Yeah, this is something I avoided talking about, because I don’t want to be critical of Cage. He’s my one true literary love. But, I am concerned that alongside the more positive and interesting political implications of the use of I Ching (a molecular conception of self, an invitation to question rather than answer, and openness to various kinds of truths), there is also some problematic cultural appropriation going on. I’m of the opinion that text is text, and is thus a part of the common, but there is something distinctly orientalist about using what is, ostensibly, a sacred text (the I Ching, of course, has a history of divination) for a poetic goal.